Growing tired of the Bali crowds and beaches we were seeking a short escape. 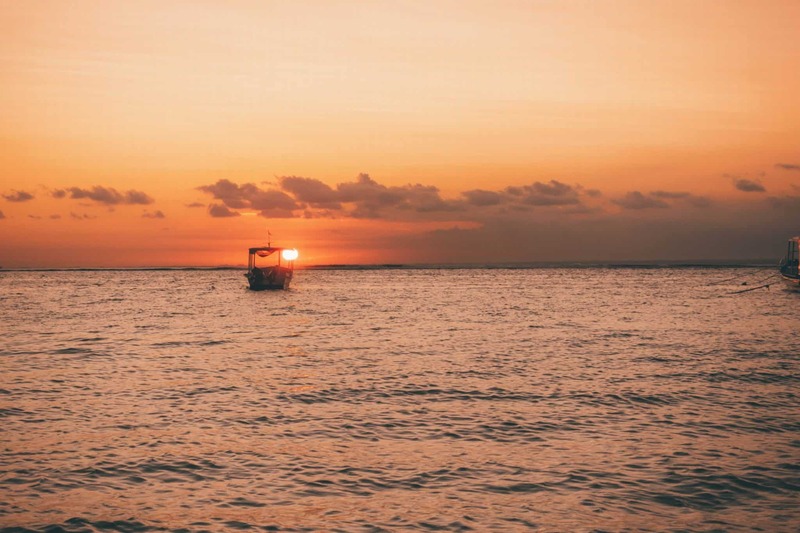 We had researched a few different options but decided that Nusa Lembongan was just a short 45-minute speedboat ride away and the beaches still looked amazing. Nusa Ceningan, Nusa Lembongan, and Nusa Penida all make up the Nusa Island group and a trip to explore them is a great addition to any Bali trip. Nusa Lembongan is easily the most popular and developed of the three islands. However, it’s still a small, dry, rugged, and less crowded version of Bali complete with turquoise water and white sand beaches. We spent 10 days on all three islands and found each to offer something different, each worth a few days of exploration. Here’s all you need to know before traveling to Nusa Lembongan. One of the main reasons we traveled to Nusa Lembongan was to get open water dive certified. 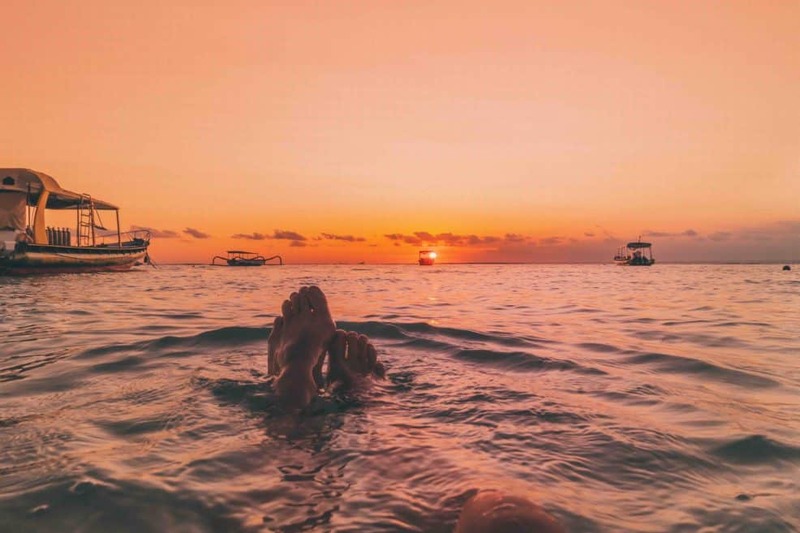 We knew the waters and reef around the Nusa islands were supposed to be out of this world, so we figured there really wasn’t a better place to learn. On top of that divers stand a high chance of seeing the Manta Ray and if lucky the magnificently weird Mola Mola. 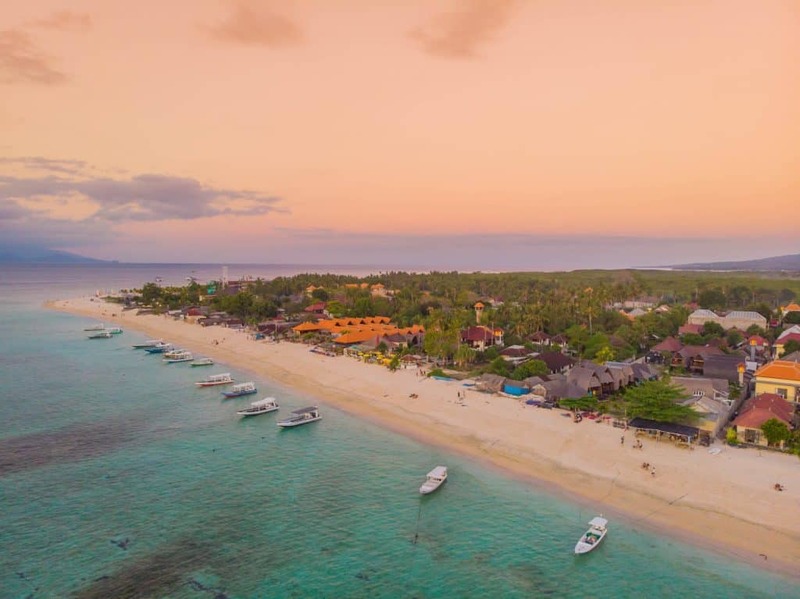 Although two popular dive spots (Crystal Bay and Manta Point) are situated off of Nusa Penida, most of the dive shops are located on Nusa Lembongan. We chose to get SSI Dive Certified with Dive Concepts because of their glowing reviews and were not disappointed. We spent a fun three days with Cedric, our charismatic French dive guide who made us feel completely comfortable under the sea. The first day was spent learning a bit of theory and in the pool getting used to our equipment, while the next two days we set out for the ocean and got four amazing dives. 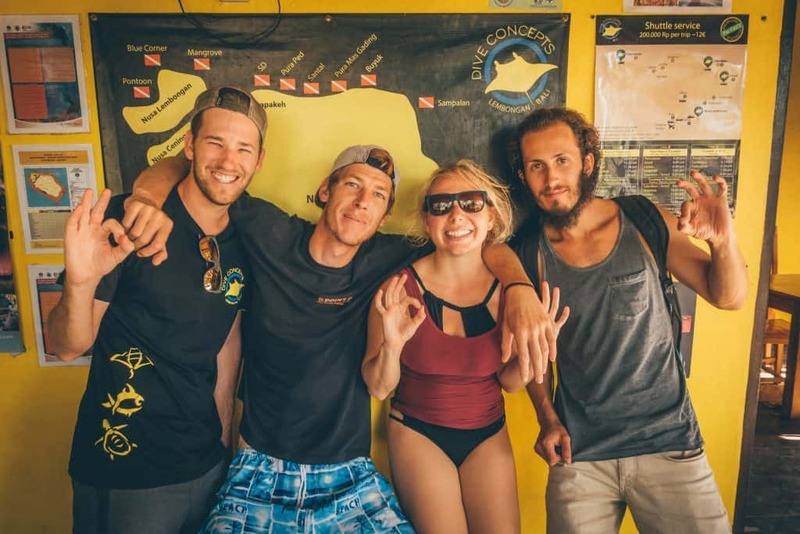 Our experience with them was so fantastic and we’ll share a post on the how to get dive certified soon! Altogether we found the Nusa Islands among some of the best places to get dive certified. Not just because of the clear water, but because it’s incredibly affordable compared to elsewhere in the world. It costs 3,750,000 IDR for a three-day dive certification course. That’s only $253, well worth a lifetime of exploration! Open water certified. Ask for Cedric for your class! Out of the three islands – Nusa Penida, Nusa Lembongan, and Nusa Ceningan Nusa Penida is by far the largest island. One would think this makes it the most popular, but the majority of people head to Nusa Lembongan. 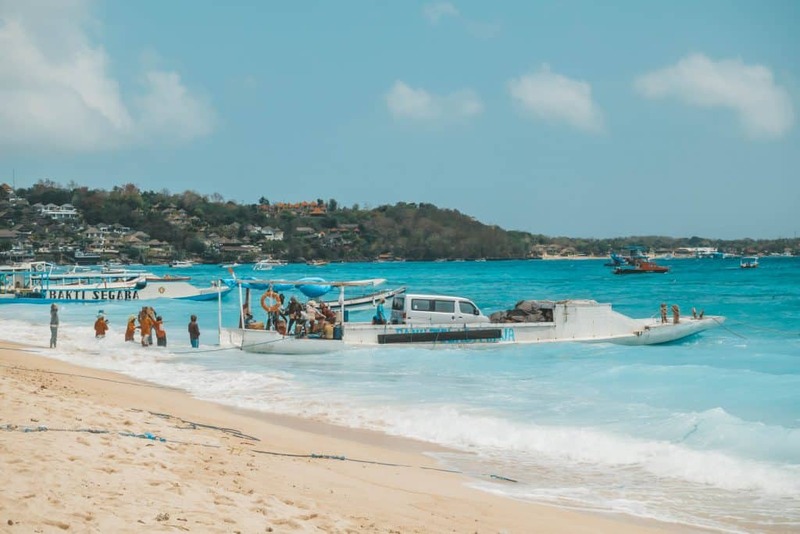 It’s the most accessible island and it has a few great surf breaks along with a multitude of dive operators. Lembongan is the only 8km is size but packs many guesthouses, warungs, cafes, and activities into the small space. Don’t worry though – compared to Bali things move at a much slower pace. 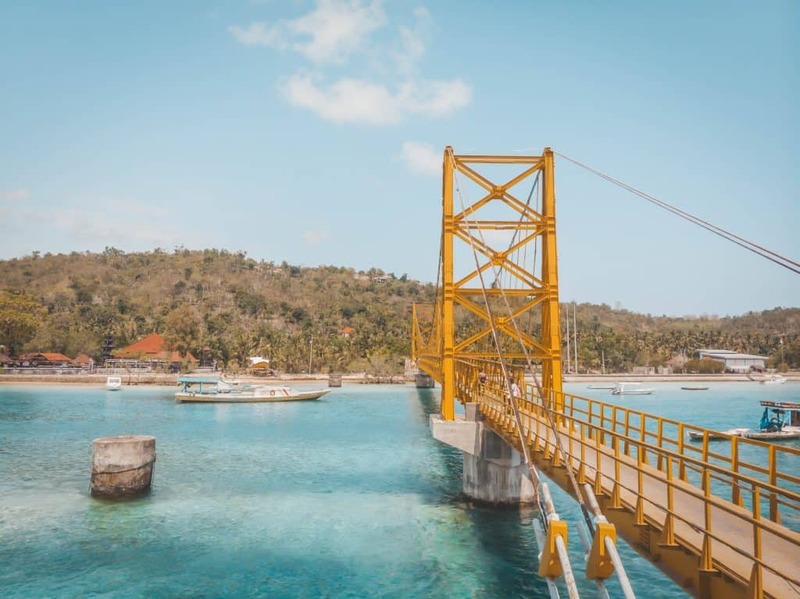 A cute short yellow bridge connects Nusa Lembongan to Nusa Ceningan. It’s easy enough to rent a motorbike (or walk) and explore both islands for a few days as it takes about one minute to cross between the two. There are not many accommodation options on Nusa Ceneginan, so we found it easier to base ourselves on Lembongan and travel from there. Nusa Lembongan is also only a short 25-minute boat ride away from Nusa Penida. The trip between Nusa Penida and Nusa Lembongan cost us 50,000 IDR a person to ride on a small local boat. Ginger & Jamu: Located right on the beach this place is expensive but oh so tasty. Dishing up all sorts of healthy foods for all types of diets. Rama Garden: This is one of the places we stayed overnight while on Nusa Lembongan. While I thought their accommodation was overpriced Cameron and I both thought their vegan food was the bomb dot comb. Warung Bamboo: A local warung with fabulous ocean views. You can find semi-local prices here, fresh fish, and good tofu curry. Nusa Lembongan is a small island to travel around. 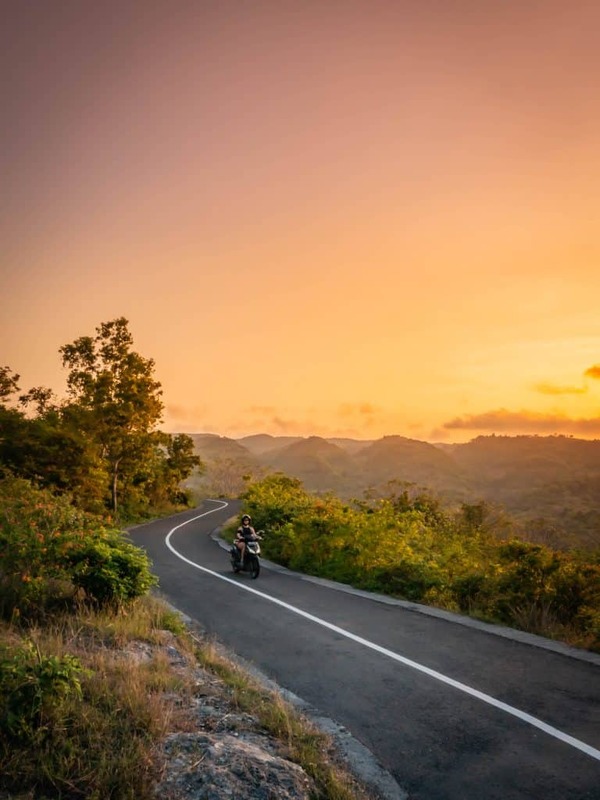 It’s best to keep things simple and maximize time with a motorbike rental. Literally, everyone and their mother will try and rent you a motorbike, and you won’t have any trouble to find one. Prices are slightly higher than on Bali, they should cost between 60,000-85,000 IDR for a 24-hour rental. Of course, the price all depends on your haggling skills and time of year. Helmets laws aren’t enforced here, but I would still recommend wearing one. 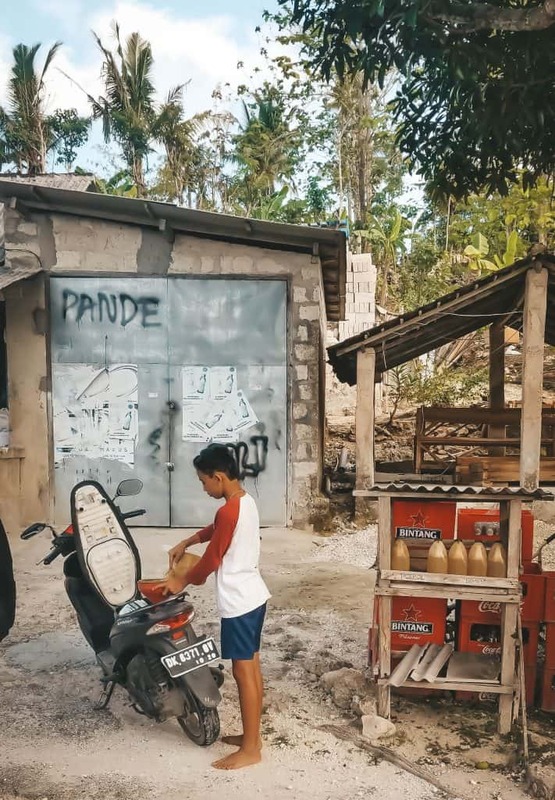 Where you buy gas in Bali – not gas stations, but from the local people. Bali is already an island where everything has to be shipped, but then Nusa Lembongan is another island in the chain. Everything on the island arrives via the slow local ferry from Bali and hand carried off on the beach sine there is no dock or port. Expect prices to be higher than in Bali and locals less willing to bargain. From motorbikes to mie goreng, and most noticeably guest rooms everything has a higher price. We paid almost 40% more for guesthouses that were comparable in Bali. For many items, you can pay up to double what you are used to paying elsewhere in Indonesia. It was hard for us to accept! You have two ways to get to the Nusa islands from Bali and two ways to depart – a speedboat or the slow ferry. Ferries leave from Sanur and Padang Bai in Bali. Sanur is the primary point for tourists wishing to travel to both Nusa Penida and Nusa Lembongan. Once you arrive at the Sanur beach/port you’ll find the area to be chaos filled with crowds and plenty of touts. The second option is the local ferry. We’ve been told the local ferry costs around 50,000 IDR and takes about two hours with questionable safety regulations. We managed to see one of the slow ferries packed with people, goods, and even a car arriving on Nusa Lembongan. I wouldn’t recommend taking the ferry because it will eat up a large chunk of your day. Our speedboat, El Rey, to the Nusas took us almost four hours, a lot longer than the advertised 45-minute boat ride. Most of the time was spent in the process of buying and haggling for tickets, waiting for the boat, loading the luggage, taking off, and actual boat ride to Nusas. Once we arrived in the Nusas we had to wait to disembark via a slow local longboat along with the luggage. Needless to say, it wasn’t a seamless adventure. On our return to Bali from Nusa Lembongan, we were surprised that the process was much shorter. With about an hour for loading and unloading and 45 minutes for the actual ferry. Ferries off the island are advertised for 200,000 IDR and this includes a pick up from your guesthouse. It’s definitely possible to get it for 150,000 IDR (but I’m not certain you will get it lower than this), but be prepared to show up to the ferry departure point at and haggle. Even though we knew could have saved 50,000 IDR a person doing this it wasn’t worth the time or energy. The slow ferry unloading goods…and a van! Each ferry on and off the Nusas will collect your shoes before getting on board. This is to prevent them from getting wet. They will give your shoes back to you when you arrive at the Nusas or Bali. Unwilling to part with my Rainbow Sandals, I opted to carry on my flip-flops with me while Cameron surrendered his. He later admitted I made the much better choice. After we arrived at the Nusa’s it was confusing to locate his shoes and when we did find them they had been dumped in a big pile of mud. I’m not saying this will happen to your shoes, but it may be worth it to keep your eyes on them. I made the effort to keep my sandals on me while on the ferry but failed to bring them inside my guesthouse at night. Needless to say, now a few Nusa Lembongan doggies have a pair of $50 leather sandals. There are many stray dogs wandering around Nusa Lembongan and they prey on peoples shoes at night. Stash them inside so you don’t walk around shoeless. I’m not joking it will happen! There is only a handful of ATM’s on Nusa Lembongan and they malfunction often. A few people at our guesthouse had their debit card eaten by the machine. It’s recommended to bring enough cash with you to get you through your stay on Nusa Lembongan so you don’t have the hassle. Most places we on Nusa Lembongan do not take credit card, but it’s not unheard of if you’re in a pinch. Nusa Lembongan is the most developed of the Nusa Islands, but that still doesn’t mean it’s Bali. We listened to many people complain about cold or salt water showers here, and it should be expected with cheaper accommodation. If you love your hot fresh water showers make sure you ask your accommodation provider beforehand if they will be provided. Of course you don’t have to stay on the Nusa Islands. There are many day tours operating from Bali that will handle all logistics for you and take you to some of the best stops. See some of those tour options here. The water around the Nusas is a stunning sight. Clear Azure and turquoise water mix with white soft sand and it’s pretty close to the perfect color combination. 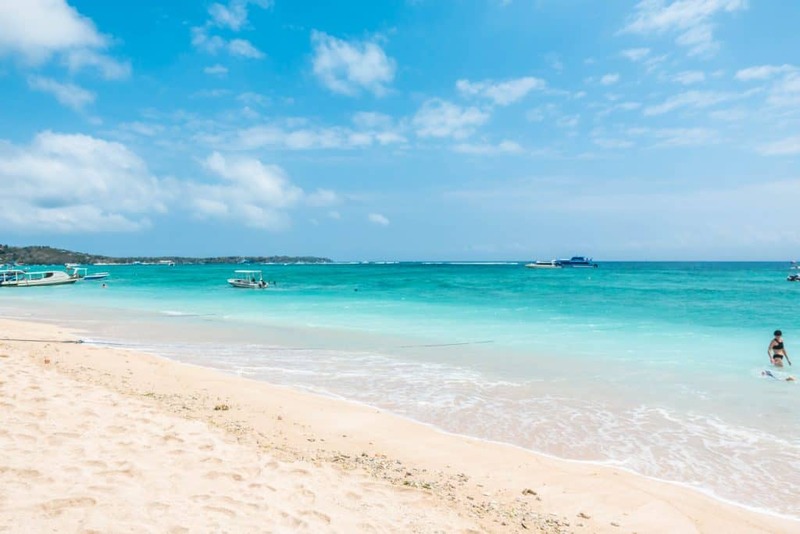 You’ll be able to find these beaches and water all over the Nusa’s, but we found the beaches on Nusa Lembongan the best place to lounge around on the sand. The only drawback is the onslaught of boats anchored on the beach since there are no harbors or docks on the island. Devil’s Tears is probably the most popular thing to do on Nusa Lembongan. It’s basically a big wave smashing against the cliffs creating a wonderful display of ocean’s power. Unfortunately, we timed this wrong and shared the beauty with about 100 other people, but we were told it’s always that way especially in the high season. If you want it all to yourself I would suggest arriving at sunrise. If you want to do an organized tour on Nusa Lembongan you can easily hop on a Mangrove Forest boat tour for about 75,000 IDR. A beautiful and very natural mangrove forest surrounds an area around Nusa Lembongan and is great to do on an overcast day. This is one of the prettiest beaches to head on Nusa Lembongan, although, it wasn’t really any different than other beaches here. It’s got some good eateries though and the vibe it’s got going is relaxed and chill. The smallest islands of the Nusas, Nusa Ceningan is just a short bridge walk away and is well worth a day trip. You can easily get there via the yellow bridge from Nusa Lembongan visa motorbike or foot. 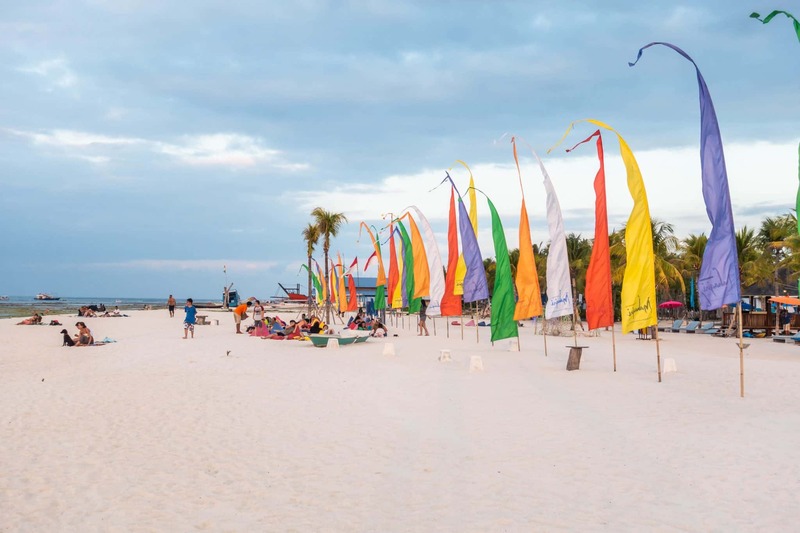 Once there you can see the dreamy blue lagoon, Ceningan cliff point, or enjoy the beach bars. Read our full Nusa Ceningen guide here. The waters around the Nusa Islands are stunning and the coral are in pretty good shape. It would be a shame not to see the glories of the underwater world here. I understand diving may not be for everyone, but it is incredibly cheap here compared to elsewhere in the world. As we said earlier we went diving with Dive Concepts one of the largest providers and had an amazing experience. If diving isn’t your thing you can easily book a snorkel trip to Manta Point on Nusa Lembongan. Then take it to the next level and head to one of the free dive schools on the island. If you’re looking to catch some waves Nusa Lembongan combined with Ceningan have some great surf breaks. We didn’t get out in the waves but chatted with a few people surfing who enjoyed it much more compared to the crowded lineups on Bali. As they said on a busy day there may be 20 people out in the water. One of the most well known is Playgrounds since it’s an easy paddle out and wave to catch for beginners. Other notable breaks include Lacerations, No Man’s, and Shipwrecks. We didn’t go basic or super cheap on Nusa Lembongan and set our budget to $50 a night for accommodation. What should get us a beachfront guesthouse is most of Southeast Asia got us far less on the Nusa Islands. We picked up a cute Airbnb, which had great gardens and grounds, a nice pool, comfortable rooms, and a hot (but saltwater shower). The place was quiet and perfect for relaxing. It wasn’t the deal of the century, but it was far better than some of the backpacker options there are. Prepare to spend more on accommodation if you are traveling during the high season. See more of our Airbnb tips here – and don’t forget to grab your $35 off! Batu Karong: One of the best places to stay on the island, but also one of the most expensive. This is the luxurious places to stay on Nusa Lembongan. The Niti Hut’s: A great mid-range option that offers a beautiful garden with pool and free breakfast. Bukit Taman Cottages: Good for couples or solo travelers on a budget. The rooms here are comfortable yet affordable and offer sea views. Bong Hostel: Hostel vibe and hostel prices. Water: The tap water in Indonesia is not drinkable. Make sure to bring a travel water bottle and fill up from the large tanks which can be found almost everywhere. Indonesia and the Nusa Islands have a huge plastic waste problem so try your hardest not to contribute to it. One of our favorites is the Lifestraw Go. Adapter: Indonesia uses the Europlug. Pick up a good universal travel adaptor before you arrive. Packing: It can get real dusty riding around the Nusa Islands on a motorbike. Wearing a buff will protect your face from all the dirt.